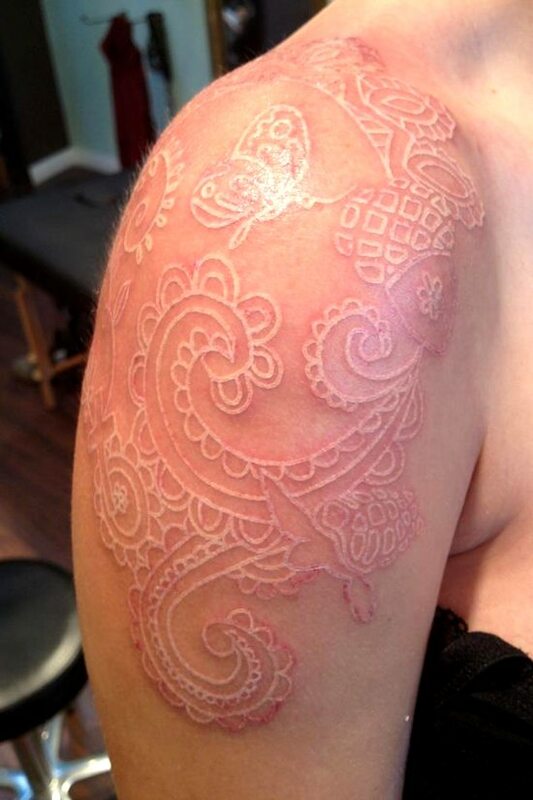 Getting white ink tattoos is a new trend, but it’s gaining popularity. Lindsay Lohan started made these white ink tattoos famous. Today, they are one of the most female-focused tattooing techniques in the world. If you go to get them, make sure you find a good artist. I’m saying this because this is a new technique and not all tattoo artists can make proper white ink tattoos. In fact, an imperfect artist might get you admitted to hospital! Take care of your body, that’s more important than anything else! The great thing about these tattoos is that they are not that loud, they’re very subtle. This quality makes them ingeniously creative and attractive. You will also enjoy viewing these Sleeve Tattoo Ideas for men and Finger Tattoos. Stop existing, start living. Love your life! A white ink tattoo for your arm or leg. Maybe this heart will look good somewhere else on your body. But this tattoo is placed perfectly. Maybe guys can also wear this one. Looks like a crop circle, doesn’t it? And here’s an example of white ink tattoo on black skin. I think it looks pretty cool, don’t you? When just a flower is not enough. The true power is inside you. I wonder if all the guys would love their girlfriends to get this tattoo…? Play an anchor role in others’ lives. This is not really a tattoo but a skin disorder called Dermatographic urticaria. However, mostly people end up using it as a temporary white ink tattoo. I think that’s a Japanese painting. I mean it can’t be little red riding hood. That’s my favorite one, one more time. Sometimes, one flower is enough. Snowflake… in this hot weather. Okay, now this maybe too much.